Many older adults are drawn to tiny houses, which can be a good way to downsize and achieve a more carefree life. However, zoning laws across the country have not kept up with the popularity of these small dwellings, which exist in a gray area between homes and RVs. Finding a place to put your tiny house can be a big challenge. Tiny houses are big news. Several TV shows are devoted to them, and many articles and books highlight this scaled-down form of housing. Many older adults, in particular, are drawn to them, looking to downsize or simplify their lives. They also appeal to young people who are just starting out in life, because they are cheaper than buying a house or even renting an apartment. Others praise a life that frees them from big financial obligations, allowing them to work part-time or travel more. However, living in a tiny house is not that simple. The biggest challenge is where to put it. Zoning laws across the country have not kept up with the popularity of these small dwellings, which exist in a gray area between homes and recreational vehicles. Also, depending on whether you build or buy your tiny house, costs can be higher than you might expect, ranging from $20,000 to $90,000. Because of the lack of good options for tiny-house locations, communities for these dwellings, much like mobile home parks, are springing up across the country. Walsenburg, Colo., became the first city in the state, and one of the first in the nation, to change its land use codes to allow tiny homes on any residential lot. On a three-acre lot in this small rural town, a developer is creating a park for 28 tiny houses. Other tiny house communities are being planned, built or finished across the country, including Lemon Cove Village in northern California, which transitioned from an RV park and rents lots for $450 to $595 per month. Orlando Lakefront at College Park in Florida, a year-round tiny-house community/RV park rents lots for $350 to $550 per month. Tiny House Estates, a tiny-house manufacturer, at the Traverse Bay RV Resort in Williamsburg, Mich., sells empty lots starting at $64,900, or lots with a tiny house for $229,000. To see a list of tiny-house communities, see “Communities, USA,” Tiny House Community. “This is the story of tiny houses that isn’t told,” Mitchell writes. “It’s not a glamorous one, it’s frustrating, it’s stressful and it will keep you up at night.” Ultimately, he decided that he wanted to stay in town, near family and friends. He found someone who would lease him land for $1 a month in return for Mitchell’s help with his website. Next up was securing water, power and building a road. The most expensive part was getting water. While many tiny house owners want to collect rain off their roofs for water, when Mitchell crunched the numbers, he couldn’t get enough supply for showers, cooking, drinking, etc. Putting in a well was prohibitively expensive, so he ended up paying the city $2,230 to connect to his property. A tiny house is generally 150 square feet but can be as “big” as 500 square feet. They are either built on wheels, which means you can transport it from site to site, much like a mobile home, or on a platform, which works if you have one place to stay. Many tiny-house owners pride themselves on building their own, using plans sold by tiny-house manufacturers, while others prefer to buy their small dwellings outright. As Mitchell found out, building the house was easy compared to finding a place to put it. Zoning laws in most cities (some are more progressive than others) don’t allow main residences smaller than 450 to 1,500 square feet. Some cities are rethinking those minimums, especially where real estate prices are high. You can apply for a variance, but that’s not a sure thing. Other zoning laws can require minimums for emergency vehicle access; sewer or septic connections; rainwater runoff control; municipal water or well-water hookups; and minimums for lot size and restrictions on how many residences can occupy a lot or given area. In most towns, a building permit isn't required for a structure of 120 square feet or less. However, these small structures are considered sheds or workshops and therefore not considered livable. Most cities allow accessory dwelling units, what could be called granny flats, although restrictions exist on how many people can live there. One tiny-house advocate recommended living in your tiny house in your backyard while renting out your larger home. Others have found success in parking their tiny houses behind other people’s houses or on a corner of their property in exchange for money or barter of services, like Mitchell did. Because tiny houses don’t have their own classification, local governments see them as an RV or mobile home. As recreational or camping vehicles, they are generally banned for full-time living outside of an RV park. In addition, many RV parks require that a certified manufacturer constructed your tiny house. (With this regulation in mind, many tiny-house builders are getting certified.) Similarly, if your tiny house is registered as a mobile home you can live full time in a mobile home park. However, as with RV parks, mobile home parks sometimes require that a licensed manufacturer built the home. As a solution, many people find a piece of property, put their tiny house on it, make all the utility connections, and then hope that no one complains to the zoning department. One city official told Ryan Mitchell, “Don’t ask, don’t tell.” Problems could arise if you live in a neighborhood of big, wealthy homes, where neighbors might worry that you are lowering their property values. If someone doesn’t want you there and complains, the city could fine you or condemn your land. However, many people who have settled down on a city lot with their tiny house have found that most local governments are not interested in chasing tiny-house dwellers off their property. As these small abodes become more popular, municipalities likely will start to create ordinances for their use. Another solution is to live in communities created just for tiny houses (see sidebar, “Tiny House Communities”). If you are not building your own tiny house, many manufacturers offer customizable models. Most building companies are small, often catering to local markets. For example, Sprout Homes, of La Junta, Colo., is constructing a tiny-house community in nearby Walsenburg (see sidebar). The company, which emphasizes “eco” homes that are energy efficient and include chemical-free interiors, sought a location for its tiny houses, because so many municipalities don’t allow such small dwellings. One of the original tiny-house companies is Tumbleweed, which operates throughout Canada and the United States. 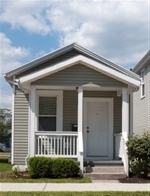 It offers several models with customized floor plans and optional dormers and skylights. One of its models, the Elm, ranges in size from 117 to 161 square feet and costs between $57,000 and $66,000. As the tiny-house movement grows, builders work to create more adaptable spaces, such as using the stairs for storage space. One tiny-home builder, Humble Homes, has a model, the Turtle Tiny House, with a first-floor bedroom that can transform into a study with a Murphy bed. Tiny Houses Popular but Can Have Big Issues was featured in the November 2015 Senior Spirit.